A demonstration to show how telehealth equipment like the new Livecare case and cart recently purchased by KPU can enhance the Faculty of Health simulation labs significantly by providing necessary education in utilizing telehealth equipment to assess, document, store, and discuss practice-related health data and information. 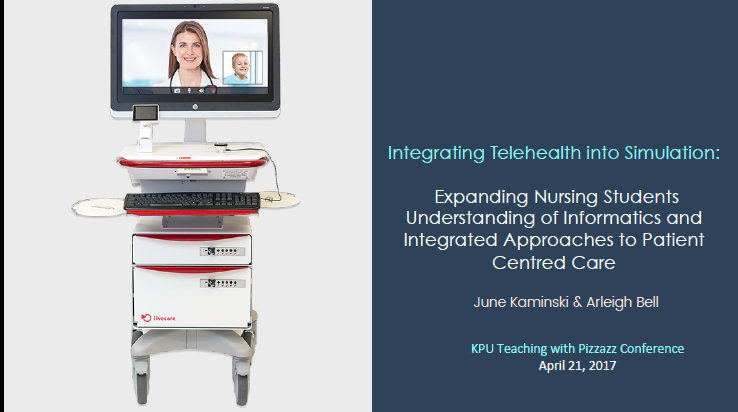 This equipment will also help KPU nursing programs meet the expectations of CASN by cultivating the entry-to-practice competencies in Nursing Informatics that all Canadian nursing students are expected to demonstrate upon graduation. 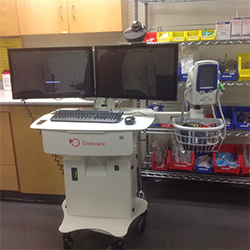 In Phase One of a three-tiered proposal, KPU will use the Livecare equipment and network to add an essential new layer of complexity and realistic comprehensiveness in assessment, intervention planning, and information documentation to the SIMs lab environment. Students and faculty from all of the seven Faculty of Health programs can work with this equipment to gain practical experiential knowledge as well as expand their ability to apply technology and telehealth within their scope of practice. Come and Learn with Us during Our Spring Sale! Lucky St Patrick’s Day Sale – 40% of ALL courses! Copyright © 2019 Nursing Informatics Learning Center. All Rights Reserved. Designed by bavotasan.com.